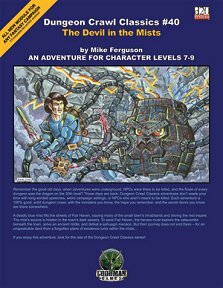 An adventure for characters of level 7-9, which can be played as a sequel to Dungeon Crawl Classics #7: Secret of Smuggler's Cove, or played on its own. Publisher's blurb: "A deadly blue mist fills the streets of Fair Haven, slaying many of the small town's inhabitants and driving the rest insane. The mist'­s source is hidden in the town's dark sewers. To save Fair Haven, the heroes must explore the catacombs beneath the town, solve an ancient riddle, and defeat a sahuagin menace. But their journey does not end there - for an unspeakable devil from a forgotten plane of existence lurks within the mists..."